We have this in stock: Limited Edition and Not Repeatable! 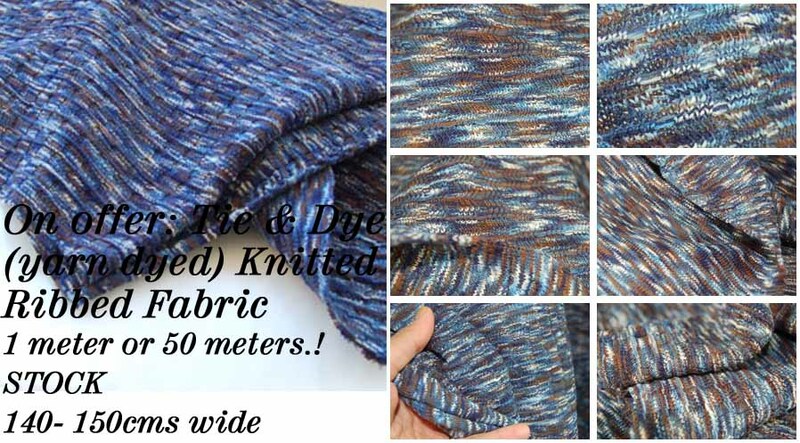 Yarn Dyed, tie & dye knitted, 10GG Gauge ribbed fabric. Knitted with a 4 x 4 set out , but a Racked Design( subtle Rick Rack Surface Pattern). Alternatively, it can be used as the reverse side, pictures also show this. Beautiful soft handle, 100% acrylic. We now offer as 1 meter, minimum. 140- 150 cms wide. Open width. 20 meters £3.99 /m + £6.90 meter. Note: Neo knitting Knits to order to, 15 qualities available from our EBay Shop or contact us direct.